Even if you are not a very technical person, you can quickly and easily add new content to your Android TV channel using video manager. When you login to Streamotor, you find a user interface that walks you through the process of uploading your new video. Video uploading is a breeze. At any time, you can create new categories, sort videos, and add or remove. 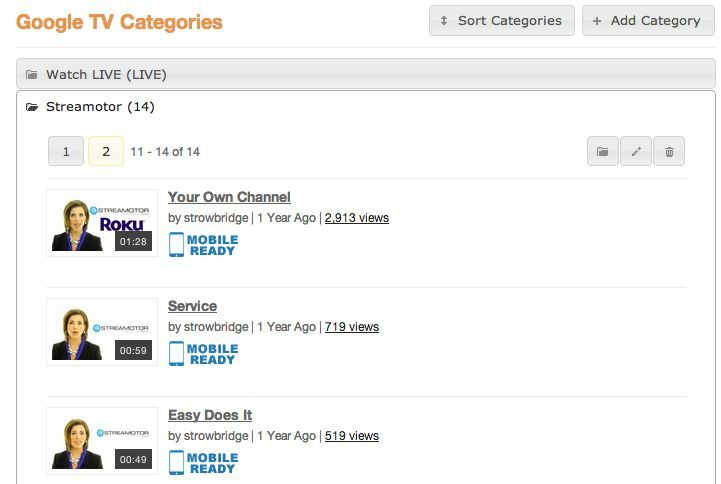 Everything you need to keep your content fresh and organized is available through the Streamotor video management interface. Learn More About the Video CMS? If you are interested in trying the video management aspect before you move forward with your Android TV channel, we offer free 14-day trial of Streamotor. Contact us and we will get help for your specific channel needs. "Jerry and the whole crew at Streamotor have been great to work with. I'd highly recommend them and have been very happy throughout the development process..."
"Our initial Roku channel was powered by thePlatform, and it was a fairly large development effort to build our Roku and Google TV channel integrated with..."
"As a Christian television network our mission is to get the gospel out to the people wherever they are. We find that the Google TV service is definitely..."
Google and Android TV are a trademarks of Google Inc.